1. 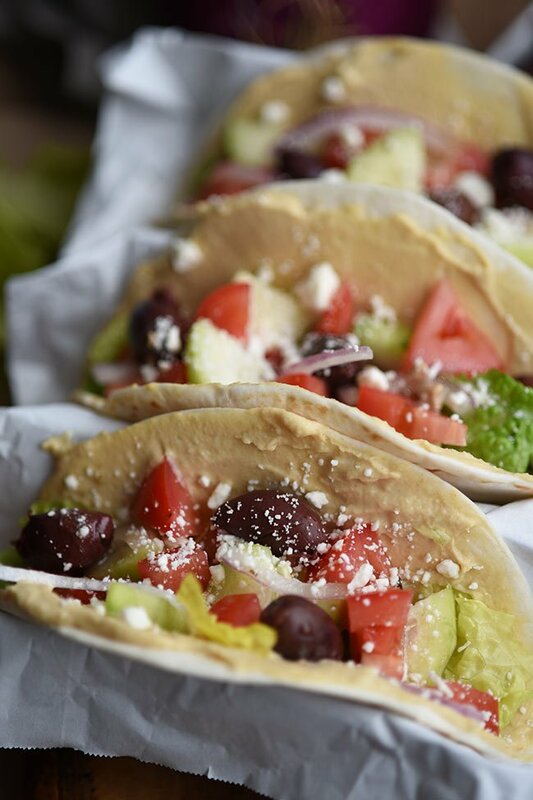 Spread 1 tbsp of hummus onto each soft taco. 2. 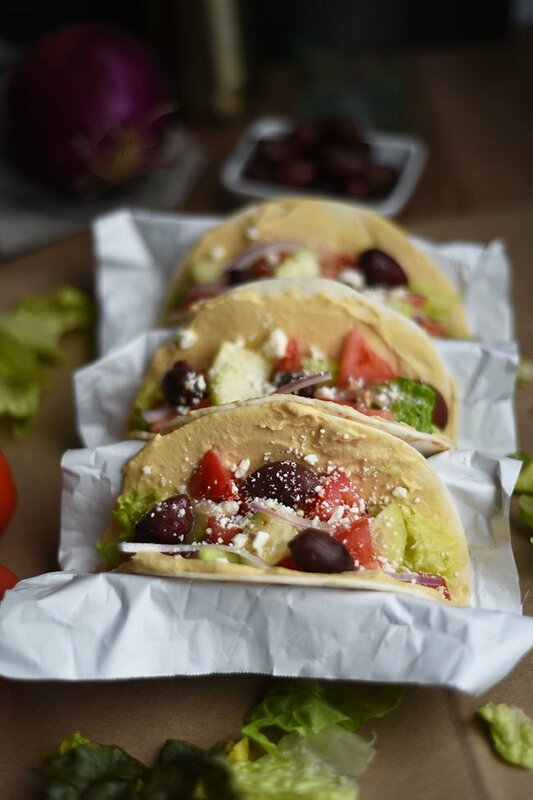 Fill tacos with cucumbers, tomatoes, red onions, olives and crumbled feta. 3. Top with 1 tbsp of Greek dressing on each and serve! 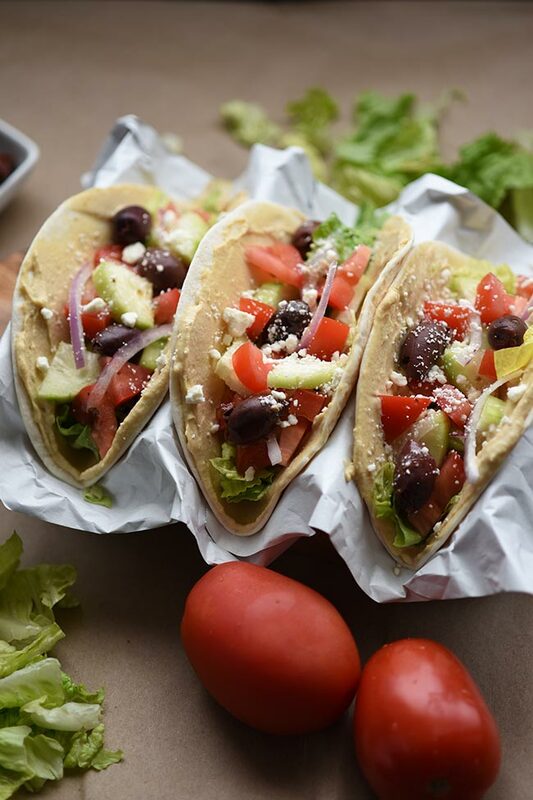 These Mediterranean veggie tacos are great for an extremely quick lunch or dinner. No cooking required! Done in 10 minutes. They are deliciously simple and full of flavor. If you stick around long enough, you may start to notice I’m pretty fond of all things Mediterranean. I will never say no to feta cheese, olives or hummus. Wrap these ingredients, put them on a bagel, or in this case, stuff them into a soft taco shell. It’s always good because the flavors are so rich. Not only do I love Mediterranean flavors, I love how easily you can make a dish that’s bright and fresh using only vegetables. Well, and cheese, and hummus and olives… what I mean is, no meat. For the record, I’m not a vegetarian. I just don’t think you always need to have meat in your meals. Like these veggie tacos. I had them for dinner tonight. Was I sad that they didn’t have meat? Nope. Did I even realize that something was missing? Honestly, no. If you, however, are missing meat here, you can add chicken or steak to these tacos. Taco lovers, you may love this. You really don’t need anything special to make these but if you’re a serious taco person, you may want to scope out these taco stands. I love mine! 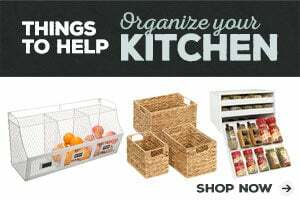 They’re especially useful for filling and serving soft taco shells. Want more easy recipe ideas? 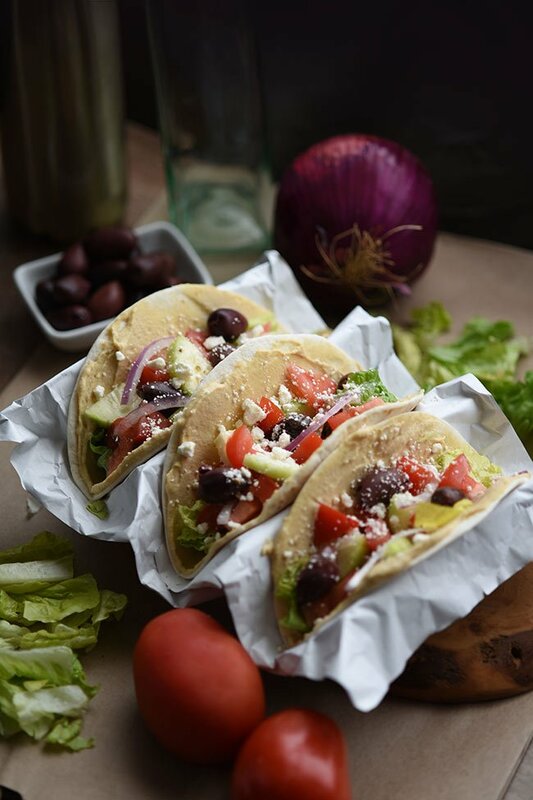 This recipe for no-cook Mediterranean Veggie Tacos was featured on Meatless Monday!